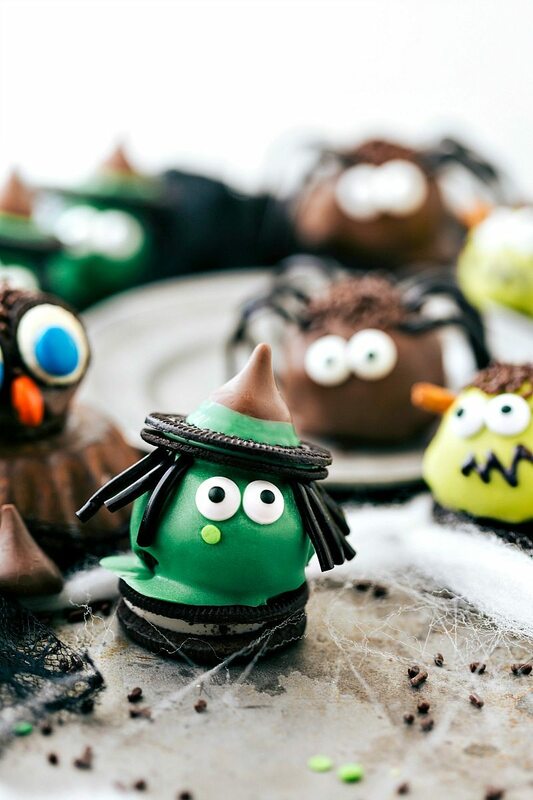 Four different ways to dress up an oreo ball for Halloween — a witch, spider, frankenstein, and an owl. 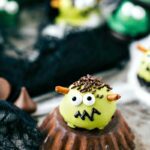 Easy and delicious treats that are perfect for a party! 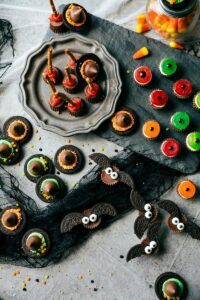 You all completely BLEW me away with how much you loved the last Halloween Oreo Truffles (see here: bat, mummy, pumpkin, and monster oreo balls) so there absolutely had to be a sequel. 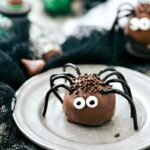 And I’ll admit right now, these have taken my favorite spot for Halloween Oreo truffles. I hope you all like them just as much! There are full written recipes for each truffle below. Please note that each recipe is for making an entire batch of ONE type of truffle. If you want to make all four or an assortment then you’ll want to make a regular batch of the Oreo truffles and then scale down the decoration parts to exactly how many of each Oreo truffle you want. The quantity of truffles you get of course depends on the size you roll them out. Pulse the full oreos (no need to separate cream from cookie) in a food processor or blender until it is in crumbs. Using a hand held mixer, beat the Oreos and cream cheese together until well combined. Chill the balls, covered tightly, for an hour in the fridge. Unwrap a kiss and dip the bottom of it into the melted chocolate. Press the kiss into the center of the oreo Thins. Place an Oreo ball on a fork and then spoon the melted chocolate evenly over the ball. Tap the fork holding the ball to remove excess chocolate. Slide the ball carefully onto parchment paper and immediately (it hardens quickly) press the hat on to the top of the oreo ball. Hold the edible eyes into the center. Press a "wart" small green sprinkle below the eye. Cut the licorice into small pieces and attach as "hair" below the hat. Cook time refers to chilling time. 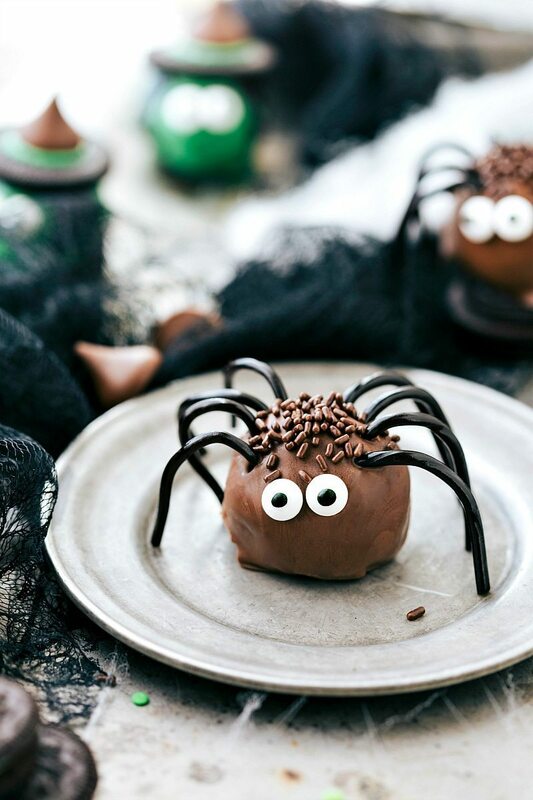 Next up, SPIDER TRUFFLES. These are actually a recipe I shared last year, but they get a spot in the video tutorial this year. 🙂 The one thing I get asked is where to find black licorice. I’ve always found it in candy aisle with the individually wrapped “gourmet” candies (instead of with regular black and red licorice). I’ve also found it in gas stations (ha!) and if all else fails it’s always somewhere online! Once the balls are chilled, melt the chocolate chips according to package directions. You may need a teaspoon (or a few) of vegetable oil to get the chocolate thin enough to dip in. Every chocolate is a little different so if needed, I'll just add the oil slowly until it coats the oreo truffles well. Before it dries, sprinkle the top of the ball with brown sprinkles and then press two candy eyes onto each ball. Cut the licorice with scissors and press into the cookie ball. Do this before the chocolate has a chance to harden. It's helpful to insert two legs (one on each side) at a time to get leverage to press the legs fully in. Allow the chocolate to harden and dry. 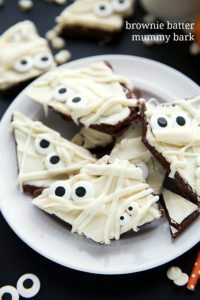 These guys crack me up — so cute and super easy to make! 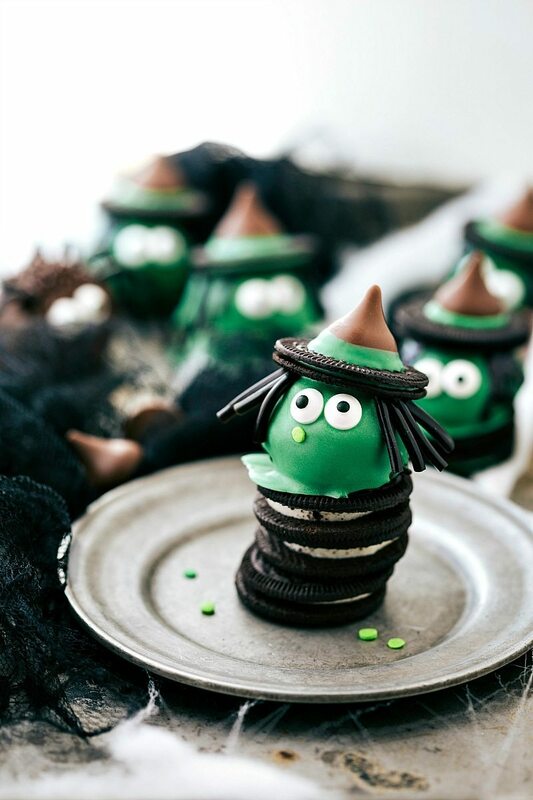 I used a different green candy melts color, but if you are making the witches at the same time, that green will work great for these. Once the balls are chilled, melt the chocolate in the microwave in bursts of 15 seconds, stirring in between each burst until melted. You may need a teaspoon (or a few) of vegetable oil to get the chocolate thin enough to dip in. Every chocolate is a little different so if needed, I'll just add the oil slowly until it coats the oreo truffles well. Top the Frankenstein with sprinkles. Press and hold two edible eyes onto the truffle. Break the pretzels at the ends and push the ends into each side. Allow to dry. Using the black sparkle gel, pipe a zig-zag below the eyes to form a mouth. 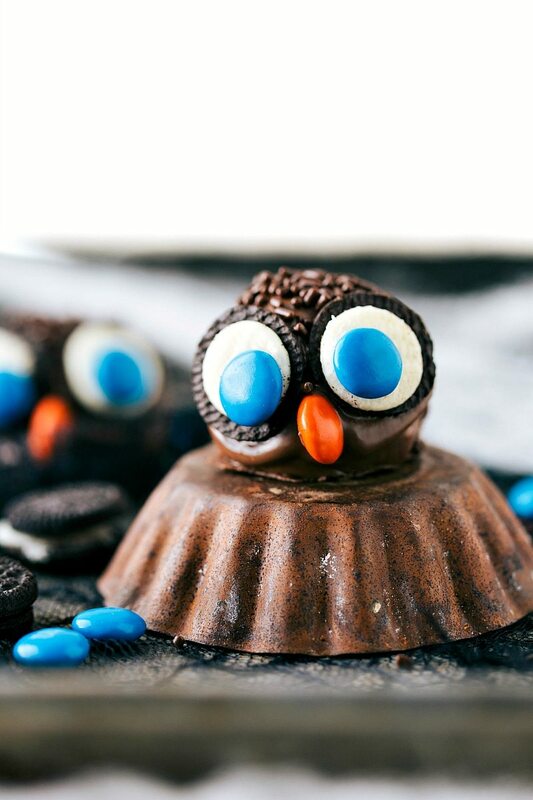 Last, but definitely not least, OWL TRUFFLES. 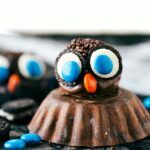 I had a hard time coming up with the last Halloween truffle and as soon as I thought of an owl, I had a blast trying to make it. The big eyes are just miniature oreos pulled apart with an M&M pressed into the center. The beak is also just an M&M! These are probably the easiest ones to make and the ingredients are super simple to find. Slide the ball carefully onto parchment paper. Sprinkle some chocolate jimmies sprinkles on the head of the owl if desired. Separate miniature oreos in half and use some more melted chocolate to attach blue M&Ms to the miniature oreos. Press into the oreo ball right below the sprinkles. 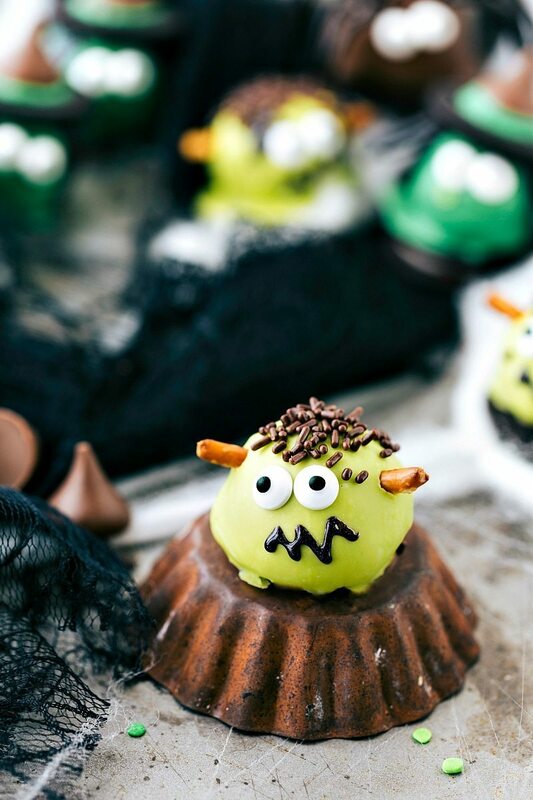 Place an orange M&M in between the two "eyes"
Easy, cute, festive, and fun-to-make Halloween treats — each with four ingredients or less. 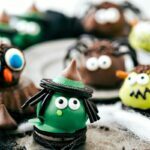 Monster eyeballs, witches hats, witches brooms, and bat bites. 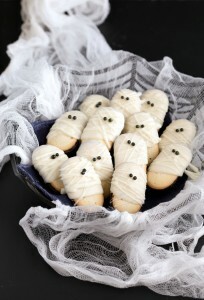 These are the cutest Halloween treats I’ve seen this year! I love these! And so would my boys. You are so incredibly creative Chelsea! These are totally adorable! I’m sure the kids go crazy over these! oh my gawd, all of these ideas are adorable!!!! LOVE!!!! Frankenstein is so cute! Can I say that about Frankenstein? lol Kids would LOVE these! Hi! You can freeze the oreo balls before dipping them in chocolate but they won’t taste or look good frozen after being dipped and decorated. Enjoy!